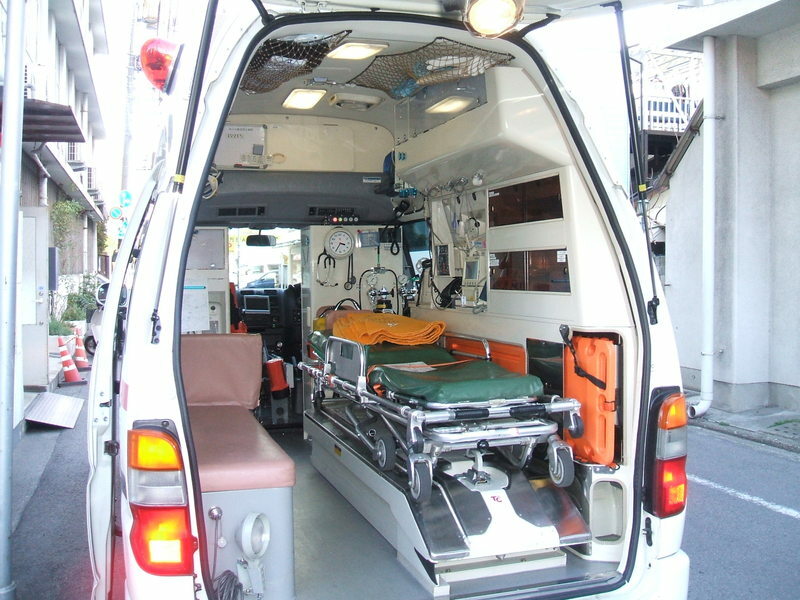 The photo shows the inside of an ambulance. There is some sophisticated medical equipment at your right hand. When the emergency lifeguard is unable to make a decision, the data of the patient is transmitted to the emergency hospital and they can get the doctor's advice. You can see other medical equipment; a heart monitor, an oxygen saturation monitor, cardiography equipment, a blood pressure monitor, an emergency oxygen cylinder, an aspiration device,,,. They eliminate redundant storage space and the ambulance is designed to be very functional and easy to use. In anticipation of frequent emergency calls, the location of the ambulance is always automatically sent to the central fire department. The commander can allocate ambulances properly. 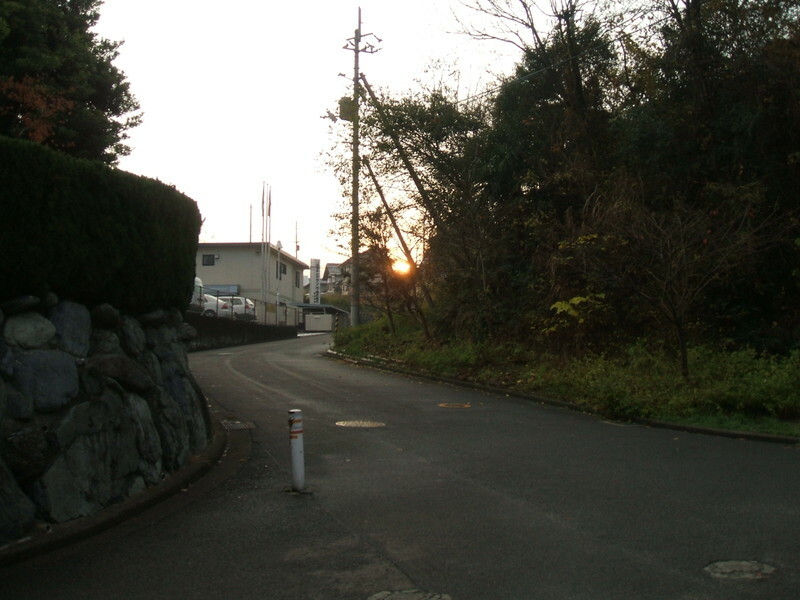 I drove my car for about four hours to my wife's original house, where my father-in-law lives alone. 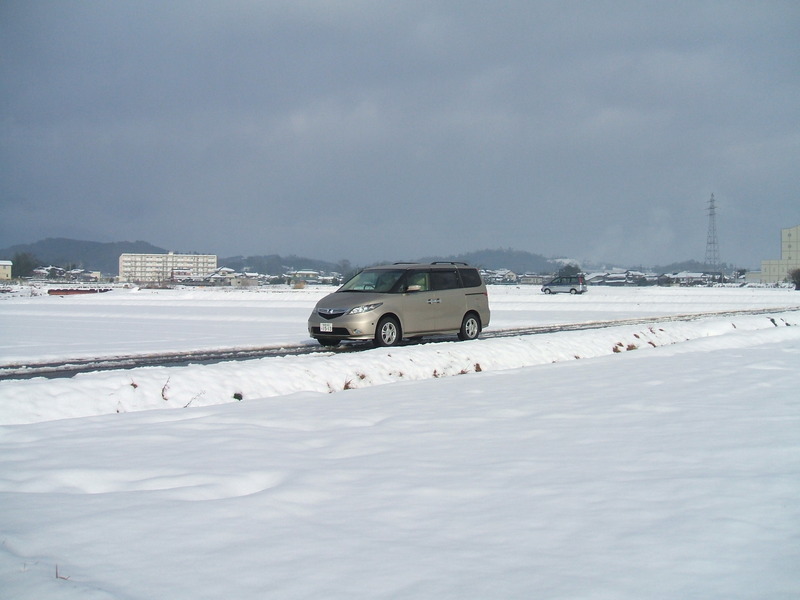 Though Japan is a small country, only a 4-hours' drive changes the climate very much. There was snow as far as the eye could see around his house. It was a snowy world. My wife had grown up in such a cold region and doesn't like winter. On the other hand I had grown up in a warm area and don't like summer. I love winter. My daughters and I were verry happy to see snow. The 2nd photo shows my wife's household grave. 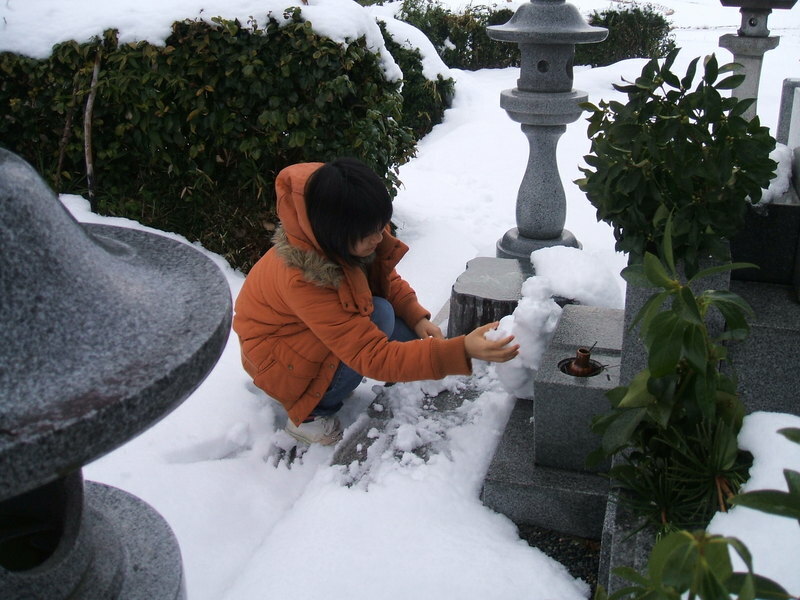 My youngest daughter is making heart-shaped offerings with snow to show respect to her grandmother and commemorate the deceased. 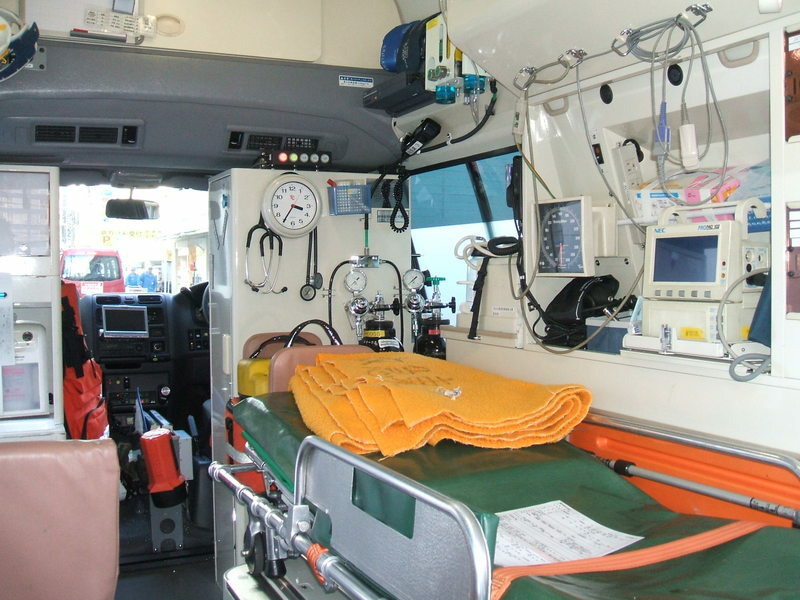 I had seen the inside of an ambulance in the US about 20 years ago. I was surprised to know that the equipment was good and sophisticated. Though the Japanese ambulance crews were barred from practicing medicine by the Doctor's Law at that time, the American crews could do some technical procedures; endotracheal intubation, electrical countershock, insertion of an intravenous line,,,. These treatments were allowed for the doctors only in Japan at that time. Needless to say, the first aid at the scene is the key to whether the critical patient can survive or not. For such a reason, the Law Concerning Emergency Lifeguard was issued about 15 years ago. By this law, the emergency lifeguards were allowed to do some treatments and their role is getting more important now. Consequently the ambulance is fully equiped for first aid. The photo shows the ambulance just before going back to the fire department after moving the patient into the emergency care unit. A surgeon who works in a Mid-Eastern country asked me to show him a Japanese ambulance. I took a few snaps of an ambulance that came to my hospital today. He is not in Iraq, but he seems to have experienced the treatment of the injured by the terror. TV news tells us almost every day that many people died or were injured at the same time by simultaneous explosions. I've never thought how the ambulance crews select patients who are transferred to a hospital among many injured or dead until I received his e-mail. 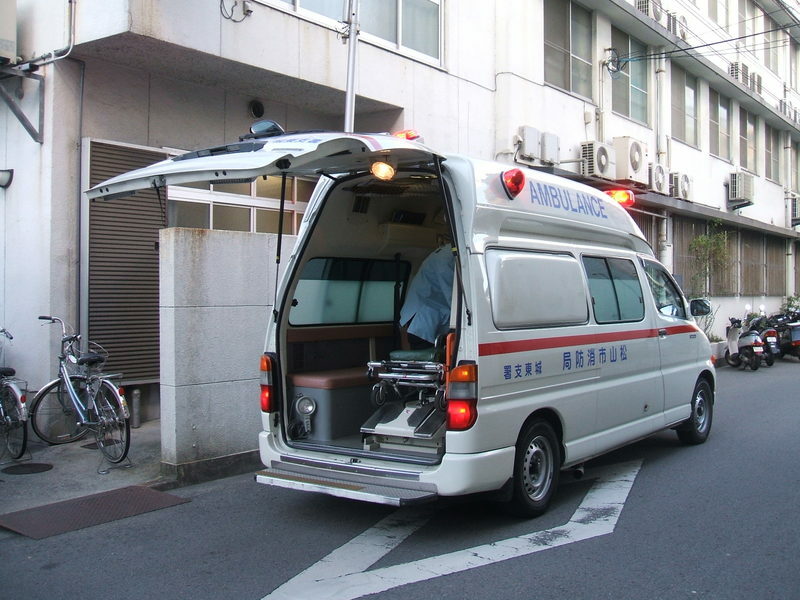 The Japanese ambulance is made for first aid and transportation of only one patient. It has only one stretcher in the ambulance. I took snapshots of the inside of the ambulance and am going to show them later. I spent a leisurely lunch break today. I didn't have any urgent task after lunch. I took a walk around my hospital and dropped in at a bookstore. I flicked through the latest magazines about PCs. 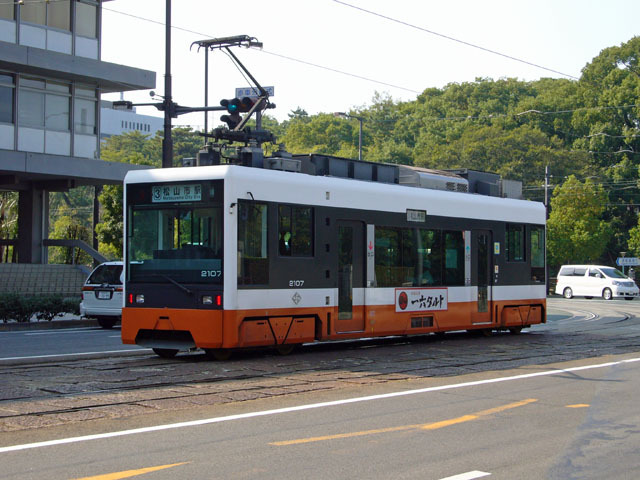 The photo shows a tram. There are two types of tram; modern and traditional. This is the modern style tram. These trams come every ten minutes in the daytime. There are some lines. One is a ring line around Matsuyama Castle. I like this line. This line is through both the busiest area of this city and the tranquil area. Most tourists can enjoy the link between two kinds of area. Another line takes us to the hot spa area. The hot spa of Matsuyama city is called "Dogo Onsen". It's famous as the oldest hot spa in Japan. The US Air force didn't bomb this area in the Greater East Asian War because they wanted to enjoy bathing here under their occupation. During the Japanese-Russo War, there was a big prison camp here. Though many war prisoners were transferred here, their treatment was very good. They were allowed to take a walk in the city and to bathe in the hot spa too. Japanese hospitality in Matsuyama was well-known to the Russians. When the Russian soldiers surrendered, they seemed to shout "Matsuyama" with their hands up. The graveyard of the soldiers who died in Matsuyama is kept up by the people in the neighborhood association and the junior high school students. Today is Sunday. It's a holiday, but I'm in hospital now and I'm on duty now, though today is Christmas Eve. I have to stay here until tomorrow evening. If there aren't any acute changes in the hospitalized patients, I have some free time. I wonder what to do today. I'm going to have a hospital dinner that the patients eat for now. This dinner is a little small in amount for me. 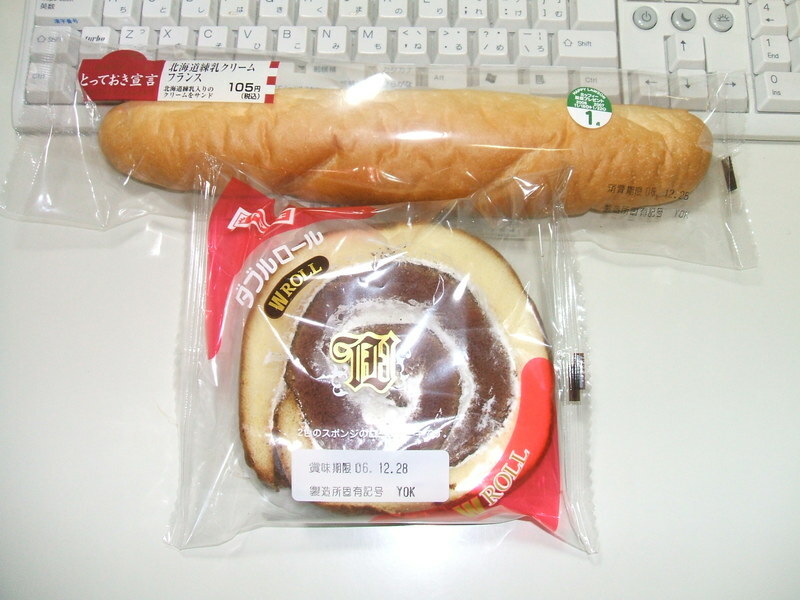 The photo shows my late-night snack. Today is a national holiday, the Emperor's birthday. I was on night duty last night. My hospital is open all day, including at night, every eight days. (See http://kumo.typepad.jp/weblog/2005/12/every-eight-day.html) Though the last night was not the due day, I had to stay late at the ward. Three epilepsy patients are hospitalized now, and two of them brought on a fit last night. I couldn't go to bed until three o'clock. About ten patients saw me this morning. All of them had some wounds and those wounds need daily gauze exchange. I had to get up by eight o'clock. I got back home at about ten o'clock. I was so sleepy and took a long nap. I felt I wasted time. I'm very sorry. I don't like wasting time. China, along with North and South Korea have spent much time in recent years distancing themselves from Japan. They view their anti-Japanese policies as a national virtue and this sentiment is encouraged in the heart of young people. South Korea, in particular, has some egregious examples of treating Japan and its citizens poorly. On a banner that was brandished by Korea at the last soccer Asian Games, the face of "An Jung-geun 安重根" was boldly displayed. According to Japanese history, An Jung-geun is the terrorist who assassinated Mr. Hirobumi Ito, who had been elected Japanese Prime minister four times. An Jung-geun was arrested by Russian police and was turned over to the police of Japan. Then he was on trial for the assassination and was hanged. He is clearly a terrorist in Japan, but in South Korea he is honored as a hero. How can there be such varying opinions? This man was not a soldier. He murdered a citizen, not a military figure. He did this deed while in casual dress, not in a military uniform, and it was during peace time, not wartime. Is his conduct heroic? The Russian police arrested An Jung-geun; obviously the police thought of him as a terrorist at that time. Not only was he not a hero, he killed a man that was actually supportive of South Korea. Mr Hirobumi Ito was against the annexation of Korea and yet, An Jung-geun murdered him. He was not a brilliant man, but the South Korean Government honors him and constructed a memorial hall for him. There is a small rock reef called Liancourt Rocks （竹島、독도）in the Japan Sea. Both the Japanese and the South Korean Government claim sovereignty over these rocks. The South Korean Government runs a sensational campaign about this sovereignty across the country and occupies these rocks by force. On the other hand, the Japanese Government has been peacefully proposing that this issue should be filed in the International Court of Justice since Sep. 25 1954. However the South Korean government has avoided or evaded the court battle all the way and continues to occupy the rocks. Seoul always says, "We are confident about our historical data". If this is really so, they should put this issue to trial. A Korean fishing boat was caught by the Japanese Coast Guard in the Japanese exclusive economic zone (EEZ). The boat was stopped on May 31, 2005 because it intruded into Japanese territorial waters and the occupants were illegally fishing. When two maritime safety officials boarded the fishing boat, the crews of the fishing boat captured and abducted them. The fishing boat broke away into international waters, where the South Korean Coast Guard was waiting for them. After a 48-hour standoff and diplomatic negotiations, the Japanese Government avoided a military confrontation and obtained the release of the 2 abducted Japanese officials. The action by Korea was clearly an unacceptable violation of international law by the South Korean Government. Moreover, the South Korean Government added insult to injury by giving honorable recognition to the South Korean Coast Guard for the rescue of this fishing boat. (Chosun [Korean] Daily News, June 3, 2005). Yes, Japan is being demonized by the South Korean Government. After this incident, in the high-level conference between both Coast Guards in December of 2005, Korea requested that they'd like to have compulsory investigative authority on the fishing boats that intruded in Japanese territories. Such a suggestion is unbelievable. Japan, of course, rejected their request. Is there on earth any country that gives up its investigative rights on criminal acts that are done at home? I ordered the certificate at once. I'm going to put it up on the wall of my study. The next target is the 3rd grade and this grade is my last goal. I need to increase my vocabulary of Korean words to pass the test. Though it's hard work for me, I think I can in the near future. By the way, I'm wondering what language to learn next. I'm hovering between Russian and Pekingese. I heard that Russian has six types of declinations. I had managed to learn the declination of German nouns into four types. Six types of declination must be more difficult than that of German. As for Pekingese, the pronunciation looks difficult. It's completely different from that of Japanese. At any rate, I will slowly start learning one of two languages next spring. I hope I'll reach the beginner level in two years. Today's evening TV news says that the price of oysters has decreased sharply because one of the origins of the Norovirus infection is said to be from eating raw oysters. Despite that there's no evidence of epidemic food poisoning from oysters, but such a rumor is getting around in Japan. It's a shame to believe such groundless rumors. I'm going to have oyster pan dish today or tomorrow. This food is very popular in Japan, especially in winter. We put oysters, tofu, various vegetables, anything if it's needed and Japanese dressing materials in the pan and boil them. Norovirus will disappear when heated up. It's lucky that oysters are cheap now. Beautiful Morning! It had been raining or cloudy for about one week and I had some strong winds last night. This morning it's very cold but getting sunny. My dog, Mocha, looks happy. He is sleeping at the entrance in my house when it's cold. I made him go out of my house and run freely. Three of four photos below were taken moment by moment. 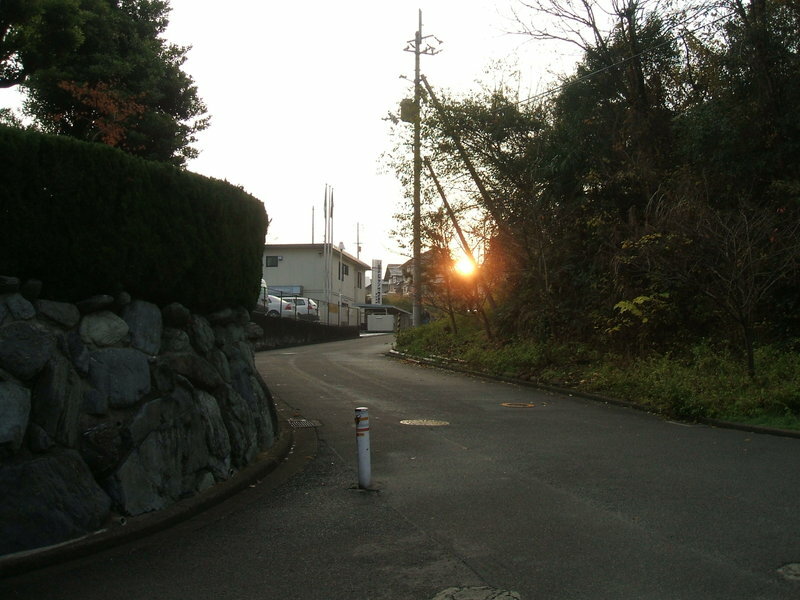 It's the rising sun, taken from my house. 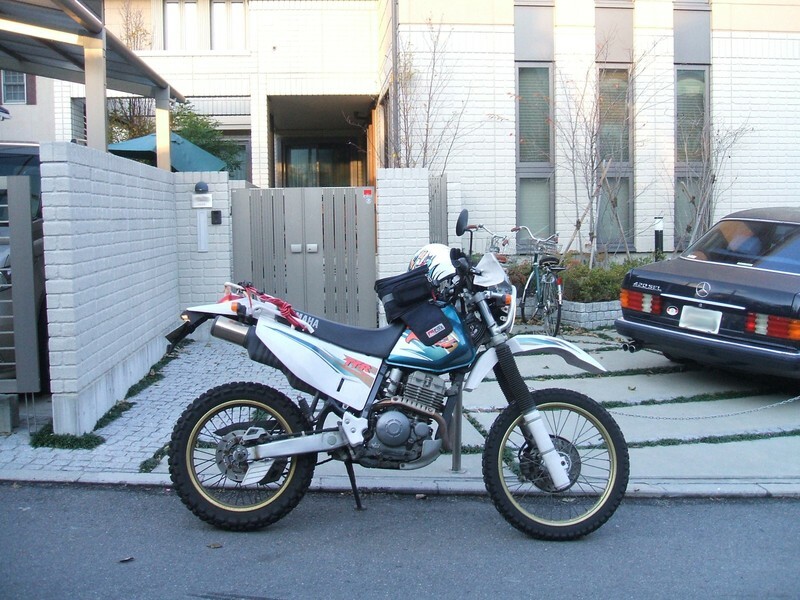 The last photo shows my bike just before starting for work. 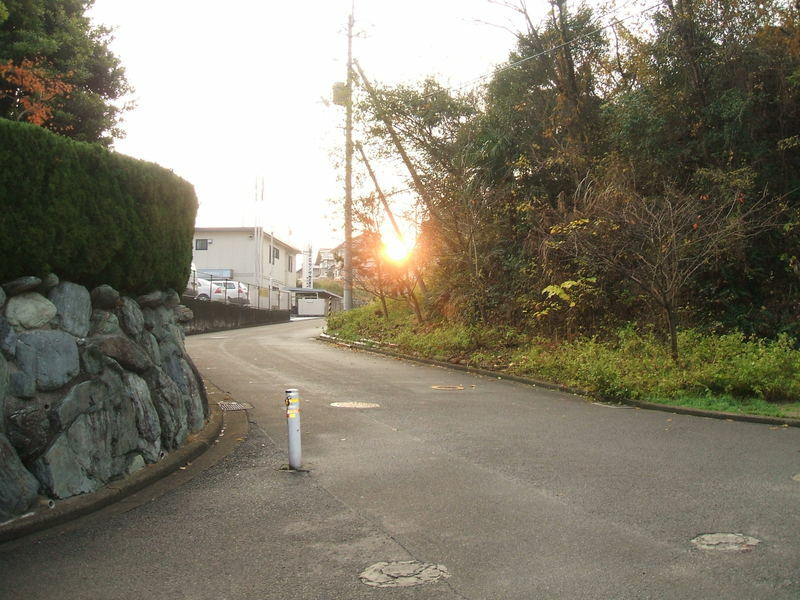 There are a lot of autumnal leaves in front of my house. I have to sweep up fallen leaves before going to work. The next morning after a windy night in winter like this morning, I have to rake a yard and my garage. It's hard and tiresome work for me. I'm a member of Mixi (Japanese biggest social networking service). Five members of Mixi got together at a small Japanese-style pub and held the year-end party last night. Our occupations and careers were different from each other, so everybody's story was fresh and intersting to others. I relaxed. Four hours had passed as quick as a wink. 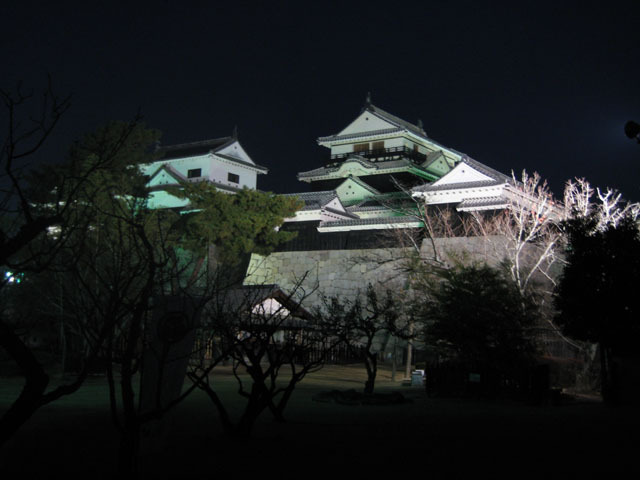 The photo was taken by one of us just before starting the party and shows Matsuyama Castle. The complete renovation of it has just been done this month. As you can see, this was taken at night under the display lights of the castle. Don't you think it is very clear and beautiful? It's because his digital camera was up to date. 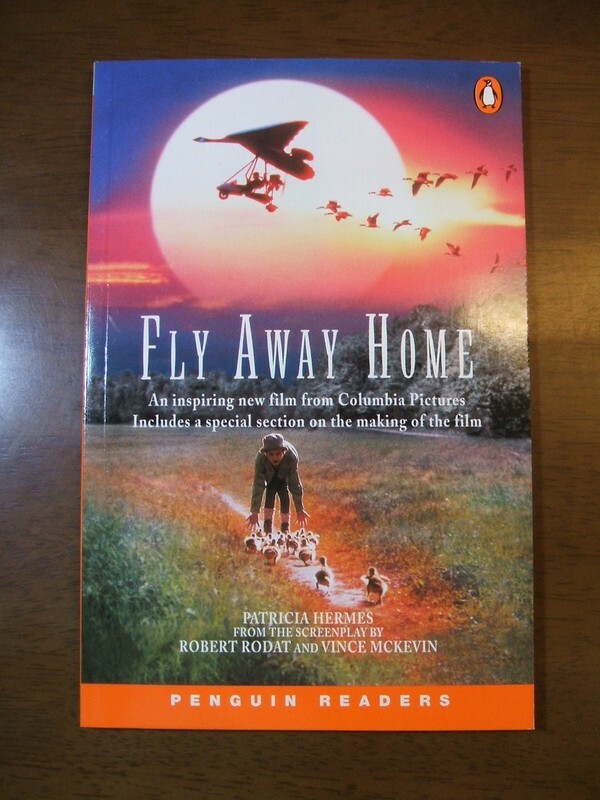 This novel seems to be a story that is made into a movie. There are a dozen photos from place to place in the book. These photos show the key points of this story. A photo shows the scene where the heroine is walking with her geese. Another shows her training to fly. She must take 16 geese to the south by plane. The story of this novel was simple, but heart-warming. I'd like to watch the movie of this novel. Acute infectious gastroenteritis caused by Norovirus is running riot in the western part of Japan now. It was the first time I had heard the name Norovirus. I scoured many papers and found that Norovirus was SRSV (Small Round Structured Virus). SRSV is well known and was written-up in the textbook when I was a medical student. I don't know why, but the name of SRSV was changed to Norovirus in 2002. I experienced the outbreak of rotavirus infected enteritis about 20 years ago in my resident days but didn't know how serious the infection of Norovirus was. If the patients are aged people, some could die from dehydration. I gave some treatments this week. 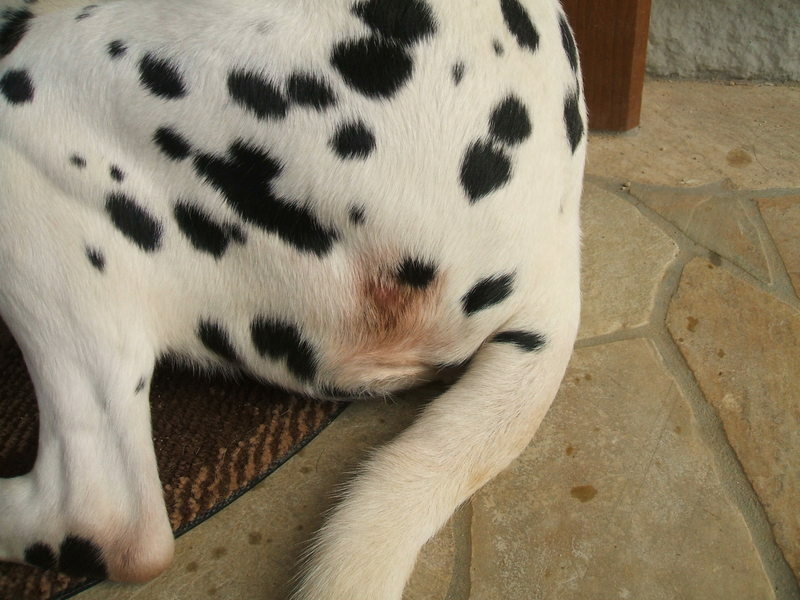 Our dog, Mocha got a cold burn on his left buttock. My youngest daughter, A, was afraid that he might feel cold at this time of the year. She put two disposable body warmers into a salt pot that was made from steel and gave it to him last night. This morning I found Mocha trying to touch or lick his left buttock and there was a burn wound. It seemed not to be infected. I'm going to wait for his recovery while I wash his wound every day to keep it clean. It's the anthology of O. Henry's short stories. Each story had an unpredictable ending and I was surprised at each ending. 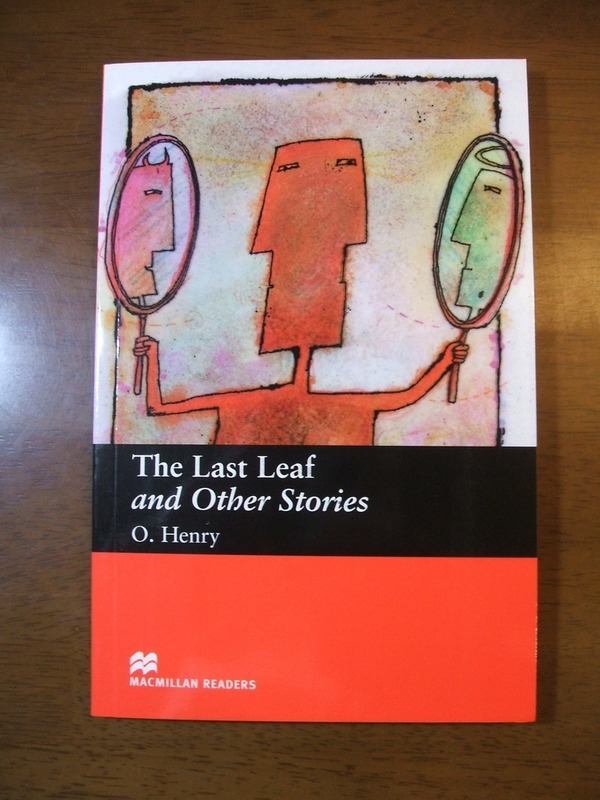 I knew only the name of O.Henry before and read some of his stories. In the opening of this book there was his autobiography. It was completely different from what I expected from the style of his writings. He committed a crime, flew the country, came back to the US and was arrested and taken into custody. Did he thrive on such experiences of adversity? I took my minivan to a car cleaning service shop today. When I was much younger, I usually washed my car by myself. I want to do it now too, but it takes an hour or more and bushes me. I make it a rule to ask someone to wash my car at this time. This shop is a time-saving and labor-saving place. While my car was being washed, I could write this over a cup of coffee. People drive on the left in Japan. The driver's seat of the Japanese car is on the right side. When I make my car move backwards, the left side mirror tilts downward automatically to make it easy to look around the left rear tire. The other day, I found that it didn't work properly. I took my car to the dealer today. The reason for the problem was due to my mistake. I didn't fully understand the function. I didn't know how to switch between the automatic movement and the manual movement.I was very sorry. Two end-of-the-year parties coincided with each other last night. I attended the hospital end-of-the-year party at first, then attended another party of my rally team. I had a little hangover this morning. Every time I have a hangover, I regret drinking too much and my wife says, "You just never learn, do you?" My parents went to South Korea today for the first time. They have visited many countries after their retirement. I think the number of the countries where they visited would be more than 20. The local travel agency that they often use organized a tour to South Korea and invited them to participate in the tour. When my family lived on a very small island between Shikoku and Kyushu (you can see it with Google Earth, 33°10'10.34"N 132°17'15.32"E), a few Koreans were camping and poaching shellfish. Japanese people who were on the island knew of their existence but got to have nothing to do with them and didn't report the matter to the police. It's unthinkable at present. Anyway, Koreans were doing their jobs. It was a tranquil time. There was no concept of smuggling on the island in those days. One day, a middle-aged lady came to my house. She couldn't speak Japanese. Something unusual seemed to have happened to them and they needed a lot of water and some medicine. It was supposed that someone got badly burnt judging from my present knowledge. There was no police, no hospital, no pharmacy and no fire department on the island. She and her daughters had only 3,4 small pans and buckets as containers of water. My parents went to the elementary school where they were working, opened the sickbay and took out some first aid kits for them. After that my parents and I carried as much water as possible to their camp and gave a few bigger buckets with lids to them. Next morning they disappeared. A year later, that lady suddenly dropped in at my house at midnight with a lot of shellfish. My parents was so happy to see her again and gave her as much water as they needed. Our family moved to another place next spring so it was the last time they saw her and her family. Before starting for Seoul, my father said to me, "I'd like to see her family again. Look for them on the internet." I'd like to, but both entering a country secretly and giving some help to undocumented people are illegal. I explained that to him. I wonder what impression my parents are getting in present day Seoul.